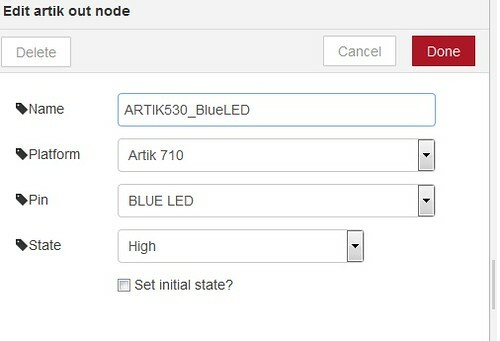 Test on Samsung ARTIK 530 connect ARTIK Cloud by using Node-RED, use ARTIK 530 Switch to control the ARTIK 530 LED lighting, go through the cloud (ARTIK 530 switch –> ARTIK Cloud Switch –> ARTIK Cloud Rule engine –> ARTIK530 LED Light), with successful result. Follow this Link to create cloud rules. if ARTIK Cloud Switch state is false, then send to send to ARTIK Cloud Light the action setOff‌. ARTIK Cloud IN receives actions from ARTIK Cloud, the Device ID and Device token are from ARTIK Cloud Light. 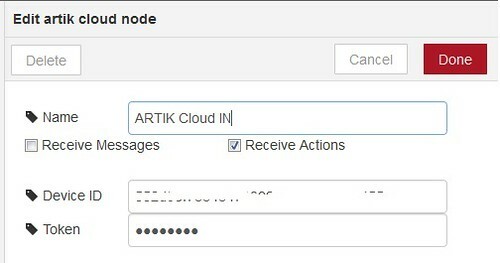 It will receive ARTIK Cloud Light action and output to next node. 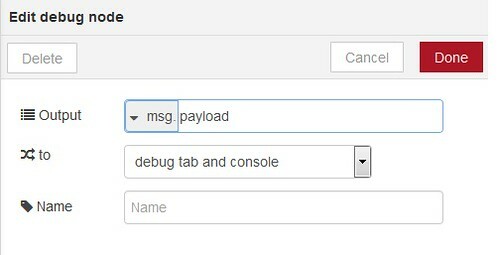 The debug node will output the debugging information in the debug panel. pwm node is as below, ARTIK 530 and ARTIK 730 only have PWM 0. The 'Control LED Function' is the function to process the ARTIK Cloud Light input data before it passes to 'ARTIK530_BlueLED' node. The testing result is as below video shows, basically whenever there is ARTIK Cloud Light action coming in, it will trigger the process function to control the PWM 0 and ARTIK 530 Blue LED light on, tested with direct action on the ARTIK Cloud Device. 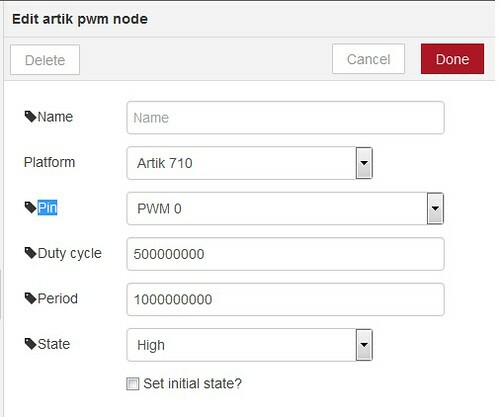 You can also control by following procedure, the ARTIK 530 Switch –> ARTIK Cloud Switch –> ARTIK Cloud Rule engine –> ARTIK 530 Cloud Light –> ARTIK Node-RED in –> PWM 0 and Blue LED light on, all are working properly. Below test is to input the Temp Sensor to the ARTIK Cloud, as I don't have the hardware Temp Sensor with the ARTIK 530, so I simulate the Temp Sensor by using the Node-RED function input and upload the data to ARTIK Cloud temp sensor. 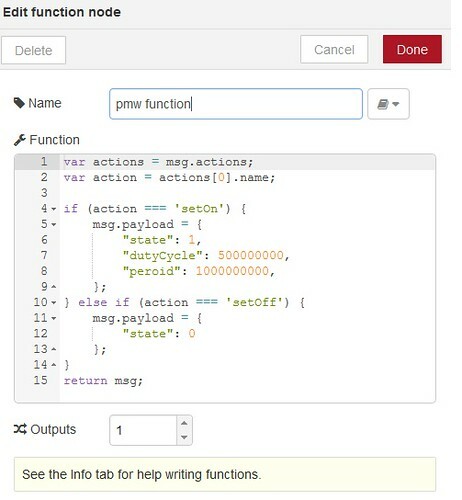 'timestamp' is as below, trigger the function every 2 seconds. 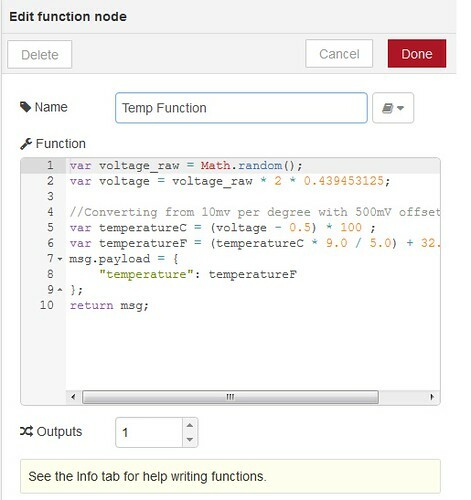 'Temp Function' is as below, output to debugging node and 'ARTIK Cloud Temp Sensor' node. 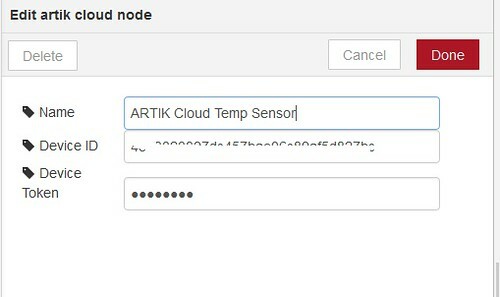 The ‘ARTIK Cloud Temp Sensor’ node is as below, the device ID and device token is from ARTIK Cloud Temp Sensor. 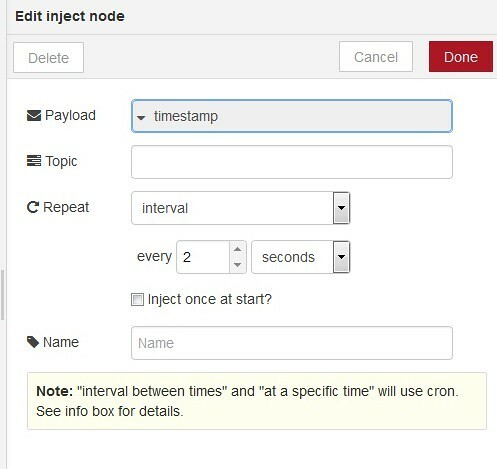 The testing result will show the temperature data will be uploaded to ARTIK Cloud, as the upload interval is 2 seconds, you will see a very clear view of waveform (fluctuate temperature) on the CHART output. Video shows the chart result. in this line, why do you use random code? Not the read the input data. in this line, what is the meaning about the number of 2 * 0.439453125?